FAYETTEVILLE, Ark. 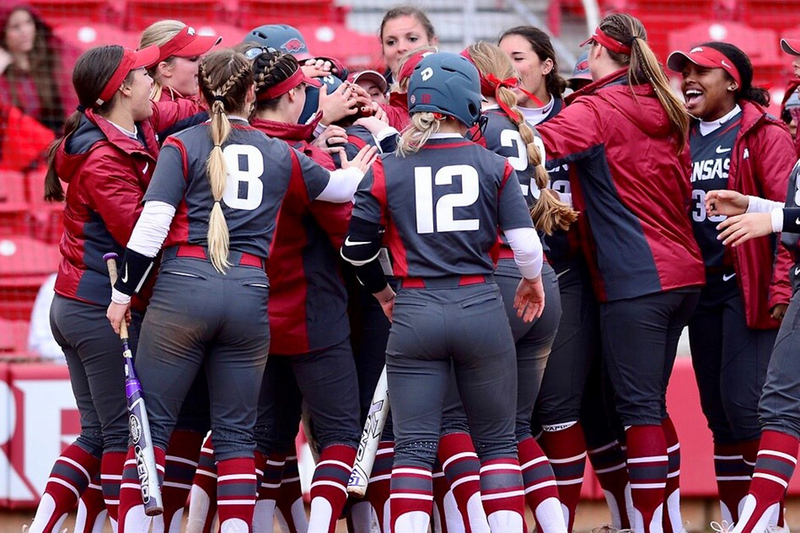 – Junior Katie Warrick continued her recent hot streak Tuesday afternoon with five hits including two home run to help the Razorbacks sweep a midweek doubleheader against UT Arlington. Overall, Arkansas combined to hit four homers in the two-game set with three in the opener. With the two wins, the Razorbacks are now 23-5 this season with a 14-0 mark on their home field at Bogle Park. Arkansas’ three-week home stand continues Friday with game one of the team’s SEC home opener against Missouri. First pitch of the series is scheduled for 6 p.m. (CT). In Monday’s initial release of the NCAA RPI, both teams are situated within the top 30. Admission at Bogle Park is free with gates opening one hour prior to first pitch. In the opener, the first of three home runs came off the bat of junior Ashley Diaz who hit a two-run shot in the first inning. It also marked the 21st home run of her career which is tied for the seventh most in program history. The Razorbacks third run scored when senior Loren Krzysko drew a bases-loaded walk in the third inning. Meanwhile, freshman Mary Haff carried a no-hitter into the fifth inning before giving up a two-out single to center. She shook off the hit and retired the final seven hitters of the game. Haff finished the game with seven strikeouts, her ninth appearance of the season with seven or more strikeouts. The complete-game shutout also marked her fourth one-hit outing as a starter. Sophomore Aly Manzo led off the bottom of the fifth inning with a solo home run to right center, the first big fly of her career. The offense generated another run in the fifth—an unearned tally—to push Arkansas’ lead to 5-0. With two hits already in the game, Warrick stepped to the plate and powered a solo shot to right field to push the game to its eventual final score. The Razorbacks reached double figures for the fourth time this season, and for the first time since a 12-run outburst against Dartmouth on March 2. After a scoreless first frame, Arkansas plated a run in each of the next two innings behind an RBI groundout by Kayla Green in the second and an RBI single by Diaz in the third. A four-run spot in the fourth inning extended the lead with the big hit coming on a two-run triple by Autumn Buczek. The visitors cut their deficit in half with three runs in the top of the fifth but Arkansas answered by getting two of those runs back in the home half of the inning. The Razorbacks’ final two runs on one swing by Warrick, another opposite-field shot to right. Buczek who was 3-for-4 in the game scored on the play. Warrick is on an eight-game hit streak with all six of her home runs coming in that stretch. Caroline Hedgcock entered the game to start the seventh but after giving up a two-run homer and walk, starter Autumn Storms re-entered to complete the game. She retired the three hitters she faced including a groundout to third to end the game. Storms finished the outing with seven strikeouts while allowing just four hits in seven innings. For more information about Arkansas Softball, follow @RazorbackSB on Facebook, Instagram and Twitter.